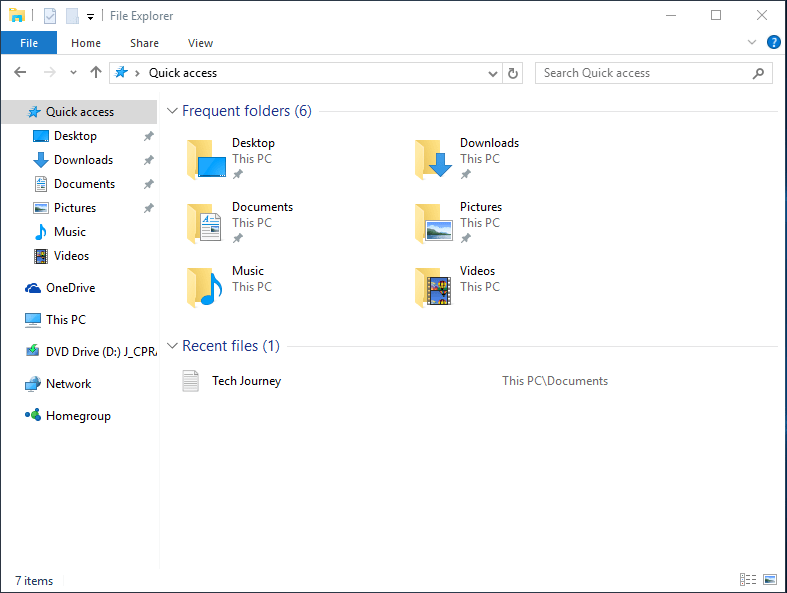 Quick Access is a new feature in Windows 10, replacing Favorites in previous versions of Windows which allows users to pin folders for easy access. Quick Access expands that capability by essentially becoming a dynamic view which automatically highlights pins frequently used and recently access files and folder locations, as well as continue to users pin files and folders to it as in Favorites. In the navigation pane of Windows 10 File Explorer, Quick Access view shows the pinned folder items. Folders with pins next to them are ones that are permanent, until you unpin them, and Windows 10 makes a few common folders as default pinned folders. Folders that don’t have pins are frequently used folders. Windows 10 calculates a frequency score that increases for the containing folder when you do things like open files, create new files, etc. Once it’s above a certain threshold, it’ll start showing up in Quick access as a frequent folder. As only 4 folders with the highest scores are shown, the Quick Access dynamically changes the list over time as threshold changed. Even though the 4 frequent folders are always below the pinned folders, some may be annoyed by the fact that the Quick Access list is kept changing, which may felt like random addition to some. Or you may prefer Quick Access to be more like Favorites, which shows only static pinned folders that you manually selected. You can bypass Quick Access view and show This PC view in File Explorer of Windows 10 if you’re not using Quick Access feature. The tutorial shows you how to disable and stop Windows 10 from dynamically shows frequently used folders in Quick Access view. In File Explorer, click or tap on View in menu bar. In the Ribbon menu, click or tap on Options (or Change folder and search options if you click or tap on the text) to open Folder Options window. Go to General tab if it’s not already there. 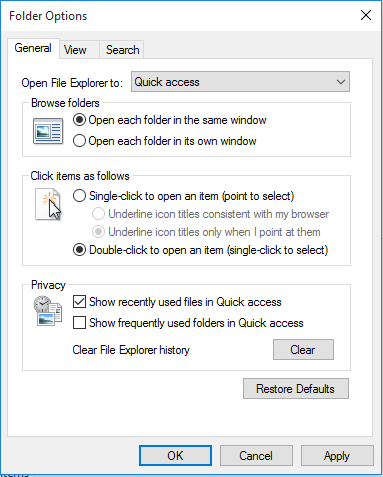 In Privacy section, uncheck Show frequently used folders in Quick access to prevent frequent folders from automatically showing up in the navigation pane and main content area on the right of File Explorer when in Quick Access view. That’s it. Now only pinned items will be shown in Quick Access in Windows 10, just like Favorites in Windows 8.1, Windows 8 and Windows 7. 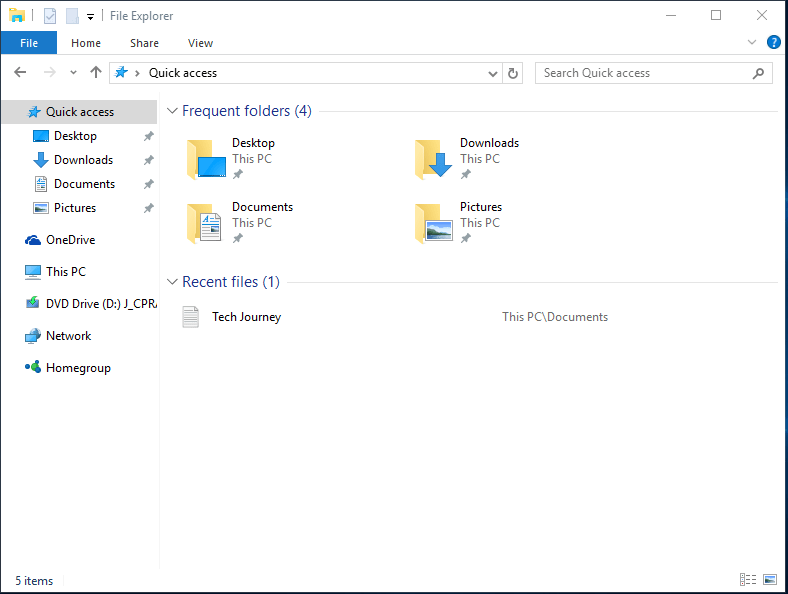 You can remove and hide recent files from the Quick Access main content area in the right pane of Windows 10 File Explorer.